﻿ Aunt Annie's Crafts - Crafts and more, for all ages! Step-by-step instructions. Printable patterns. Updates each week. Welcome to Aunt Annie's Crafts! Take a look around. You'll find crafting fun for children, teens and adults. A craft how-to is featured each Monday, with a special craft treat added each Wednesday, and at the end of the week it's Friday Fun with simple crafts for families, groups or classrooms. 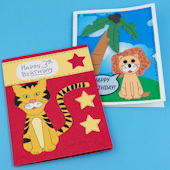 Featured this week: Birthday cards with a 3-dimensional banner! Bear Birthday Card - Make a special birthday card featuring a stenciled teddy bear holding a 3-D banner. Select from two stencil templates to create birthday cards for sending to friends and relatives. Customize the card for other occasions by switching out the banner held by the bear. Wednesday Treat: Make crafts with triangles of all sorts! This week's Wednesday treat is a roundup of crafts based on Triangles! Have fun while you explore a variety of triangles in two-dimensions and three-dimensions. You can make boxes based on triangles, make games like Triangle Board Solitaire, and have fun with puzzles featuring triangles! 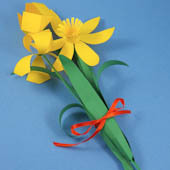 Even Paper Flowers are cut from folded triangles. Come back on Friday for a new Friday Fun craft project! 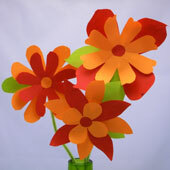 This Week's Friday Fun: Quick and simple way to cut paper flowers! For more family, classroom or group crafts see the Friday Fun Crafts collection! 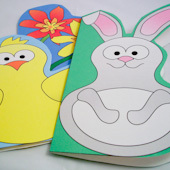 Featured last week: DIY cards for Easter and spring! Wednesday Treat: Learn to weave on a cardboard loom! 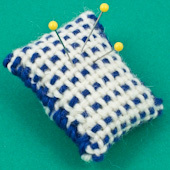 Last week's Wednesday treat was instructions for how to Weave a Pincushion! It's easy to make a pincushion (or dill pillow) in any color you like with a little yarn woven into fabric on a cardboard loom. It's just a matter of forming a tube with the woven fabric, stuffing it and sewing it close. Last Week's Friday Fun: Make a pennant of colorful flags for Easter! 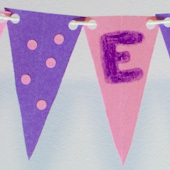 Easter Pennant Banner - Children will enjoy picking bright colors to make this decorative paper craft. Hang your Easter pennant in the entryway of your home, or mount it in your classroom for a lively touch of springtime cheer! The pennant flags are also a nice addition to an Easter basket. Here's a sample of the crafting fun from previous weeks. Visit the Project Index to see it all. Looking for crafts for family, classroom or group craft time? Check out the Friday Fun index for quick and easy crafts. 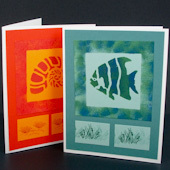 Greeting card tutorials are a regular feature on Aunt Annie's Crafts. Each tutorial builds on prior card projects. It's like taking a class on making handmade greeting cards. This month's featured card tutorial is Stenciled Cards. In this tutorial, you'll learn how to make cards using stencils and acrylic paint. You'll also be shown how to make your own stencils using paper punches or a few snips with scissors. If you are new to card making, the tutorials in the Card Class are a great place to learn many techniques for making beautiful cards. Then for more ideas and techniques, go on to Card Class 2.